Laura Mulvey’s seminal 1975 Visual Pleasure and Narrative Cinema defined what is now known as the male gaze. In a nutshell, the term describes the world — men, women, everything else — being viewed through heterosexual male eyes. This approach creates all kinds of problems, in particular women getting reduced to both sexual objects when they’re being viewed (in a film) and to passive observers when viewing (a film). Consequently, the male gaze is a lot easier to detect when you’re at its receiving end, when, in other words, you’re not a heterosexual male (if you are one, the film world basically looks like the world you’re familiar with — note this needn’t be approached only in a literal sense: superhero movies, for example, clearly are completely fictional, but their use of the power dynamics between the genders in all likelihood is not). The male gaze obviously has applications in the world of photography as well. These applications concern both the way photographs are being taken (and by whom they’re being taken), but also the way in which they are being embedded in the various contexts they’re part of (and by the people doing that). There has been a growing awareness of this issue. See, for example, discussions of gender inequality in photojournalism and the many reports of sexual harassment: this 2018 article by Kainaz Amaria is all you need to read to learn more about the topic. Out of curiosity, in mid 2018 I compiled statistics of the photobooks featured in the first two volumes of Martin Parr and Gerry Badger’s The Photobook: A History. The numbers paint a grim picture. Of the books discussed in Volume 1 (Volume 2), 191 (174) are by male authors and 18 (37) are by female authors. Please note that I counted the books once, so there might be counting errors. Also note that I counted each book listed, so some artists are represented by more than one book. Specifically, in the case of Volume 2, there are 11 books by Roni Horn, which somewhat inflates the already low number of books by female authors. 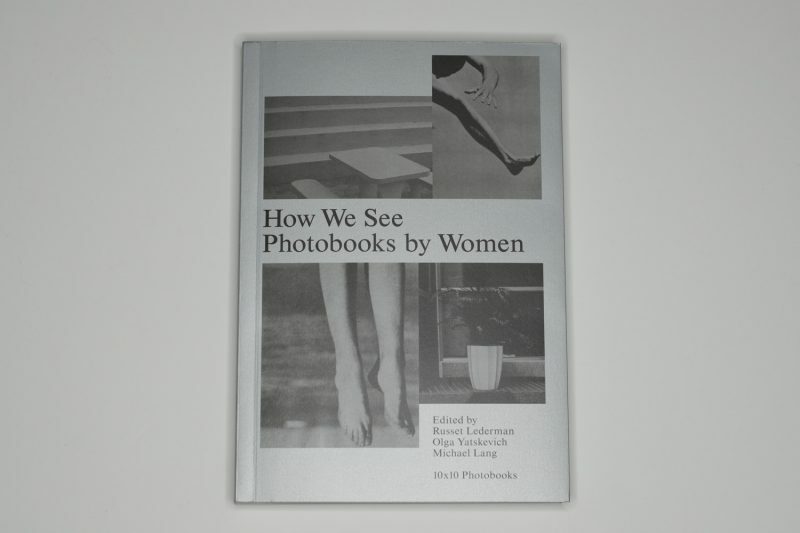 Perhaps not surprisingly, How We See: Photobooks by Women starts out with a list of similar statistics. For example, books by female authors account for 16.2% of publishers’ titles or for 22.9% of shortlists in the various “best of” award or year-end lists. The selection of books assembled by editors Russet Lederman, Olga Yatskevich, and Michael Lang is thus overdue. The structure of the book follows the model used earlier by the same editors. A group of ten selectors was picked to cover their respective geographic regions, each selecting ten books. There’s an introduction for each selector, and the books are then briefly introduced on a spread with a picture of the book’s cover, a very short text, and a few sample spreads. In addition, there are a few essays in the beginning. At the very end another group of selectors, mostly curators and photo historians, provide a list of historical books. I’ve heard stories of the lists of books covered in Parr/Badger being distributed before the books came out so that people would be able to get the books before the inevitable rush to buy them would set in (I have more than one source). I don’t know if a similar rush has already set in for the books covered in How We See. The part of me that finds the whole secondary photobook market distasteful hopes that’s not the case — after all, good books should be easily and widely available instead of being items for (mostly rich) collectors. But the rest of me is hoping that there is indeed going to be such a rush — just not by the usual collectors, but by photoland in general. There aren’t just the statistics given in the book; a quick glance at the result of the 2018 Photobook Listmas (at the time of this writing [31 Dec 2018], that’s “705 books that were listed as the best, the most interesting, relevant, notable, exceptional and/or favourite books by 248 different people/institutions on 107 lists”) shows that photobooks by female authors still are underrepresented, are underseen, if not straight out unseen. How We See makes a strong case for many books that so far have been overlooked or neglected. For example, there are multiple books by Sophie Calle included, who I think is an exceptionally strong artist and who also is an artist that I yet have to see mentioned in discussions of text and pictures (to give just one example). There’s Abigail Heyman‘s fantastic Growing Up Female, which not only is as timely as when it was produced but which also has very strong lessons to offer for students wanting to learn about editing and sequencing or (again) the role of text next to photographs. And the list goes on and on. With its geographic focus, there are plenty of books from areas that you simply will not find in other books about the subject, whether they’re from Africa, parts of Asia… The selectors also picked books based on their own preferences and interests. This might strike the reader as an obvious fact, but it is clearly acknowledged in the book — as it probably should be. So if you are interested in photobooks, I don’t think there’s a way around getting yourself a copy of How We See: Photobooks by Women. It’s not only a must-have addition to the world of books about photobooks. It also is going to become an essential part of a larger, long overdue discussion in photoland about who gets to make the pictures, who the pictures are of, and who gets to see them. If I had to describe what I’m looking for, it would probably be this: I want to look at pictures that make me feel in love with photography again. It’s obvious that I don’t get to enjoy such pictures all that often. But at the very least, I want to feel that whatever it is that I’m looking at was made with that intention: After all, if you, the photographer, are not passionate about your work, how can you expect your audience to be? There is very little photography about music that I enjoy. I love listening to music — all types, ranging from fairly abstract electronic music to black metal to Polish folk punk to whatever else. But most photography made around music just doesn’t excite me at all. Maybe music about photography is also like dancing about architecture? Concert photography is, well, mostly awkward, and how could it not be? You could attempt to visually put into your frame what you experience, but then you usually end up with either motion blur or a bunch of people oddly grimacing. Were it not for a lack of guitars, you essentially wouldn’t be able to tell the difference between a rock concert photo and one done at an air-guitar competition. Much other music photography is advertizing photography, done for the sake of album covers, written articles, or whatever else. And then I came across Michael Schmelling’s Your Blues. The book instantly satisfied the need I expressed above, making me feel in love with photography again. How did — and still does — it do that? To begin with, while it’s a book centering on music, specifically music in Chicago, it’s mostly being that in a loose sense: there is very little of what I described above, and where traces of that appears, it mostly refuses to follow what one could think of the usual conventions of music photography. It is, in other words, not a book attempting to confirm a viewer’s expectations. Nothing is being sold here, no artist, no style of music, not even a particular life style or scene. As much as I dislike using the word, given it often is so badly abused, the book is inclusive in a very broad sense. But it is not inclusive through all possible edges being rounded, leaving behind a general feeling of insufferable blandness. 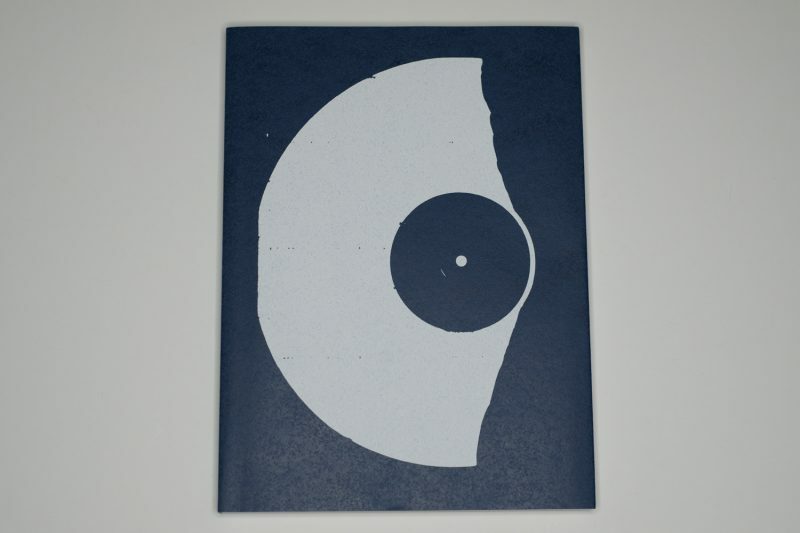 I suppose another way to describe the book would be to say that it’s not so much about music as it is, to borrow and adapt a phrase I heard David Campany use in the context of art, of being with music, whether it’s making it or experiencing it as an audience. Once that idea in the book is established, anything can visually become a part of that. Well, at least that’s what one is led to believe. It’s Schmelling skill at finding the right moments, objects, crops that makes it work. I’m very strongly reminded of the work of the late Michael Schmidt, in particular Waffenruhe. Photographed in then West Berlin, the book of course is about the Wall, but going far beyond that, it’s a book about an atmosphere. It’s a book about finding oneself in that odd place at that particular moment in time (ironically just a couple of years before that Wall opened). Much like Schmidt, Schmelling is trying to get feelings — and not so much objects or people — into his pictures, which often enough arrive at being very consequential because they show something so seemingly inconsequential. As a book, Your Blues employs a nifty technique to communicate with the viewer. While starting out with the gallery-show-on-paper format (blank page, picture, blank page, picture, …), after a while groupings of photographs pop up. Up to eight photographs vie for the viewer’s attention in various spreads, which has the effect of drastically charging up the atmosphere. It is mostly in these groupings that some of the aforementioned conventions of music photography can be found. But because they’re merely parts of a larger visual set, the power of their cliches is vastly reduced. It’s visually thrilling — just as thrilling, I should say, as finding so many breathtakingly beautiful photographs in the sections before and after, photographs that are simple, that showcase a photographer who does not feel the need to dazzle his audience with any trickery: these photographs don’t feel self-conscious. Pictures, in other words, are allowed to be pictures, with no added mumbo-jumbo needed. That’s the best one can hope for. Undeniably, there is something visceral about the photographs of Diane Arbus. I don’t think a viewer could look at any of her better pictures without arriving at a set of possibly complex emotions. I remember when Revelations, the last major retrospective, was shown at various Western museums, I was happy to be able to see it in London, having made a stop there on an otherwise work related trip. The show did not disappoint, and neither did the accompanying catalog (find a review of the book here). As I dove more into this particular artist’s work, my take of it shifted in a manner that I was able to notice. Usually, I am unable to observe this effect in action. Usually, I will look at an artist’s work years after I spent time with it and realize that I am able to appreciate it a lot more — or less, without there having been any shift in between. In the case of Arbus, I have noticed how I have become more and more skeptical of the work — even of the best photographs. There probably are various factors that have contributed to this shift, such as the inevitable passage of time that has blunted the effect of Arbus’ work. I’m getting older, and repeated viewing has moved my reception of this (and other artists’) work from an immediate stage towards a more delayed, cerebral one. But I also read two books, An Emergency in Slow Motion by William Todd Schultz (a book that most photographers I spoke with absolutely hate) and the more recent Diane Arbus: Portrait of a Photographer by Arthur Lubow (find a review here). Both books portray the artist as a deeply troubled person, a person whose moral compass might have been a bit off (to phrase this mildly). Of course, background knowledge inevitably will make any person see an artist’s output in a different light. However, I typically attempt to see any piece of art in a way that ignores such knowledge. This is an impossible task; but I feel it’s one that is necessary. After all, if a deeply troubled person takes photographs in which there is no trace of such troubles, why should the background information enter the discussion? Should, in other words, something that cannot be traced in a photograph be used to evaluate the merit of the photograph? I don’t think so. In Arbus’ case, this conundrum does not arise. I don’t mean this as a flippant statement, but I don’t think a genuinely happy and well adjusted person would have taken these photographs. I’m not a trained psychologist, so I’ll leave things at that. Of late, some of the larger galleries in New York have begun to produce exhibitions that rival museum ones. For example, the 2015 Picasso & The Camera exhibition at Gagosian vastly surpassed anything I’ve seen at MoMA in a long time (also admission was free). So somehow, I had this expectation that the Diane Arbus exhibition would be along those lines. Would you present an exhibition of photographs, some of them never seen before, all of them taken under circumstances that just lend themselves to all kinds of problems without any added organization in the form of text (wall labels etc.) and additional materials? Well, I wouldn’t — but that’s what they did. No labels, nothing. Instead, things were presented just like any other Zwirner exhibition — a long row of photographs in frames. There was a note: “there is no photography allowed within the exhibition” — the Arbus Estate had not allowed Lubow to reproduce photographs in his biography, so there’s a pattern here. But this is not why I’m not showing any photographs here. I’m not showing any photographs because the work in question, Untitled, is much too problematic for way too many reasons. I had a brief discussion with my students after they had seen the exhibition. A few of them looked genuinely shocked. How, one asked me, was this not othering the subjects? I didn’t have an answer, and I don’t have one now. So a photographer goes to social events at “residences for people with developmental disabilities” and photographs the clearly very unsuspecting subjects in ways that at times find an almost perverse pleasure in what the camera can do to people. Diane Arbus obviously wasn’t/isn’t the only photographer to go about this game (for example, a new Bruce Gilden book just came out). But well into the second decade of the 21st Century, that ought to be the topic for some serious conversations. Whether or not Diane Arbus was able to recognize the cruelty of her endeavour I don’t know. From what I have read, the answer is probably no. But we, as viewers, ought to react to the fact that that cruelty more often than not resulted in photographs that are cruel themselves. You wouldn’t know this from the press release. “The results are strangely lyrical,” it claims, “even tender, documenting a world possessed of its own rituals and codes of conduct that remain somehow mesmerizingly familiar.” Well no, the photographs aren’t strangely lyrical (unless both words don’t mean what I think they mean — entirely possible, after all English is only my second language), no, for sure most of them aren’t tender at all (some are outright brutal), and I don’t even want to dissect the rest of that statement — that would be too depressing. In photography circles, discussions concerning exploitation are often swatted away as if they were merely flies bothering you. This is partly because of the macho cult in photography that I wrote about earlier this year. And of course, one could argue that all photography is exploitation. Given that there has been a vastly raised awareness of the power of photography in the general public — as, for example, street photographers know, I see a renewed need to have discussions about exploitation — certainly in circumstances where it is as blatant as in Arbus’ Untitled work. What is more, all history, not just the photography one, is an ongoing, evolving process. It’s never written in stone — that would make it a form of ideology. I’ll leave it up to American photo historians to unpack the machismo at the heart of so much of what John Szarkowski was engaged in. And there are efforts going on to bring to light the many voices that so far have been silenced or ignored. For these efforts to be truly valuable, though, we also have to engage in re-evaluating the photographers that have entered the canon. Such a re-evaluation includes the publication of biographies (there probably is a reason why the Arbus and Avedon estates were so unhappy about the recent biographies produced about these photographers). But the re-evaluation also needs to include discussing the photographs. This re-evaluation does not mean withdrawing pictufor res and locking them up. 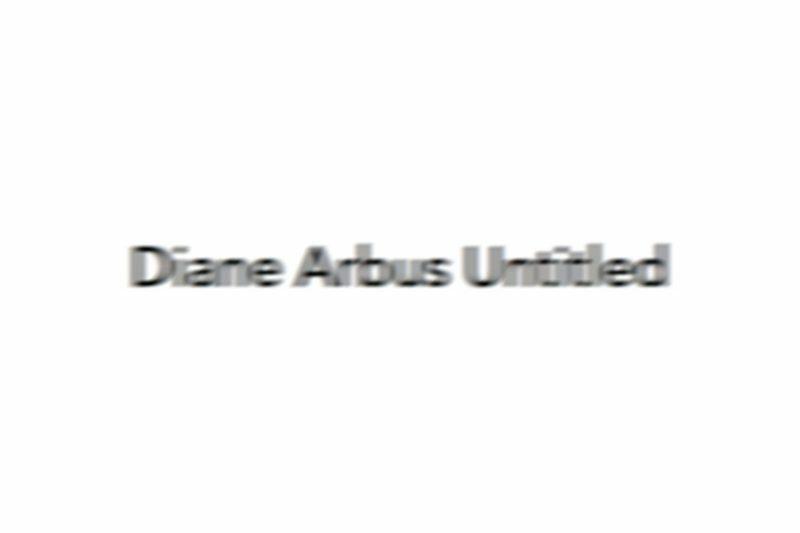 In fact, Diane Arbus Untitled could have been a good exhibition if there had been an attempt at curation (here meaning an organization of the material in question) with plenty of added text: why do some pictures look so much more produced than others? Which ones were shown previously and (possibly) why? And most importantly: how can we properly deal with the gigantic moral dilemma that arises out of this particular photographer, an artist with an unrelenting cruel gaze, pointing her camera at people who not only have no idea what’s happening, but who also are some of the most vulnerable members of society? That, and only that, should be the approach to show these photographs. After all, these cultural artifacts are not fully untethered from our times, yet. They weren’t dug up by archeologists, who now have to attempt to decipher their meanings. They come out of a specific context, they were initially promoted and discussed in a specific context, and they have now entered our context, a context which has made great strides towards achieving equality and respect for all of its members. Obviously, we’re not there, yet, and the Trumpian counter-movement has been demonstrating the hard work still ahead. That hard work needs to be done by all of us. Specifically, photography’s cruel gaze needs to find its reckoning. When I grew up, there was considerable anxiety in the town I lived in about its status as a Großstadt. In Germany, a Großstadt (“big city”) is a city that has 100,000 inhabitants or more. Due to a variety of economical factors, various of them self-inflicted by the city’s leadership, Wilhelmshaven was teetering around said mark for a while, to drop just below around the time I turned ten years old. As is the case with many symbolic entities, the general hand wringing around this number stood in no relation to its actual importance. By the time I left there, the city was already 10,000 people below Großstadt status (having lost essentially 10% of its population in a decade). Now it sits at around 75,000 people, a grim decrease if there ever was one, albeit one not unknown in those various places around the globe that have seen deindustrialization combined with governmental incompetence and outright indifference. A Kleinstadt (“small town”), in contrast, is a town that has between 5,000 and 20,000 inhabitants (everything in between, the web informs me, is called a Mittelstadt, a term I had never heard of until I looked it up). For different reasons, the life of Kleinstädte (yes, that’s the German plural) is difficult. There is precious little to do there, so people — meaning of course especially younger people — tend to leave for life in the big cities (obviously not for Wilhelmshaven, but since we already established that it’s no longer a Großstadt that might be obvious anyway). You would imagine that for this very reason Kleinstädte make for a very boring and/or depressing subject matter. Well, they do, and they don’t, as Ute and Werner Mahler demonstrate with their Kleinstadt (the book — in the following, I’ll stop using the German term unless it refers to the book). In a sense, as this artistic husband and wife team has demonstrated with their previous Die Seltsamen Tage (Strange Days), they use the camera the way a scientist employs a seismograph: what is recorded is a record of something larger that is moving underneath in a seemingly imperceptible manner. So while their camera records only the surfaces that reflect light, these literal surfaces speak of forces operating on a much more profound level. To begin with, through their photographic treatment, the various locations visited by the photographers appear as one. There might be differences between the various small German towns, but a viewer wouldn’t necessarily be able to tell from the pictures. Travel to any of these places, and despite the variation in possible the shapes of the churches, the materials houses are made from, or in the few shops available, the visitor will come across a specific atmosphere — it is this atmosphere that is captured in the Mahlers’ photographs. Having photographed people before, the photographers do so again, focusing on young people. These small towns have very little, if anything to offer to the young — it is they who leave for larger cities, in search of jobs, excitement, less confinement. But before they can leave, they will have to be old enough, and until then they will have to make do with what — and who — is available. In Kleinstadt, Ute and Werner Mahler widen their approach to work with large groups of people — meticulously arranged in often very surprising compositions. Without these portraits of individuals, couples, and groups the book would would probably leave the viewer with an intense sense of dread; and that dread doesn’t fully evaporate as there are human faces to behold. But these human faces offer a glimpse of hope, while serving as a reminder that the dread felt by the viewer must (at least in part) be part of someone else’s daily life. 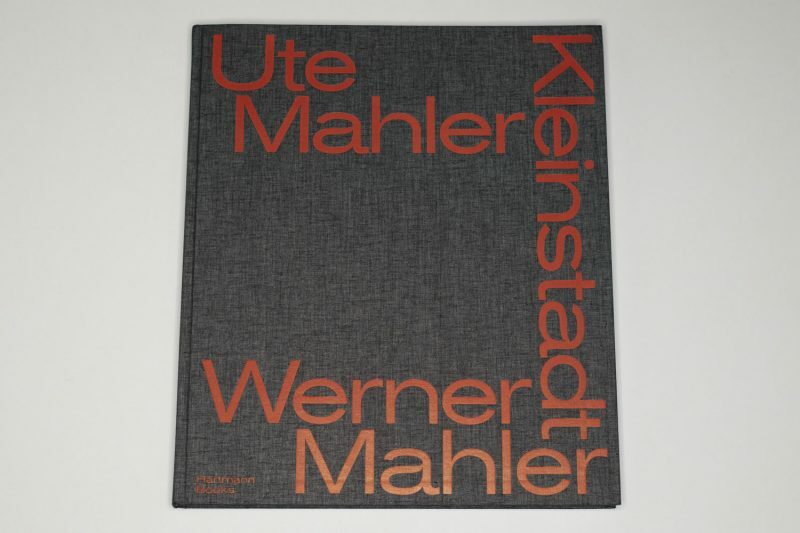 How or why Ute and Werner Mahler are not more widely known and appreciated beyond their native Germany escapes me. As a photographic couple, they’re without peers, especially in light of their fractured biographies caused by what is mostly being spoken of as German reunification. I should add that given over the years I have become friends with Ute and Werner, my voice inevitably is biased. While you might be able to discount what I have to say, you won’t be able to discount these photographs. Artistically, they operate at the highest level, fusing contemporary photography (which often is a bit on the cold, if not heartless side) with a sense of very slight (but equally skeptical) romanticism and a belief in the ultimate goodness of all those willing to pose for a picture, however difficult it might be these days to feel that such a belief is justified. Ordinarily, seeing photographs described as “timeless” makes me uncomfortable. Often, I am made to feel someone is trying to get away with not getting (or wanting to get) closer to the pictures in question. For example, photographers will justify their choice of black and white claiming they want something “timeless.” Critics often approach the medium in the same way. It is true, the removal of colours will make it harder for a viewer to discern when the pictures might have been taken. But the word “timeless” ought to for sure stand for a little more than merely muddying the waters, doesn’t it? If anything, what we really should be talking about when we use the word “timeless” is a photographer’s sensibility, a sensibility that in some form is translated into the pictures: what do the photographs make us feel (instead of: what do we see)? Are those feelings tied to specific eras, or do they connect to something that falls outside of the continuum of time? And what would that falling out of time mean? A photographer for whom I think the descriptor “timeless” could be used is Mark Steinmetz — maybe not for all of his work but for most of it. There is a new book entitled Past K-Ville, which provides a good opportunity to put my idea to the test. To begin with, check!, the pictures are black and white, but I already noted that’s not good enough. You can, without all that much effort, roughly discern the time when the pictures were taken; and the book states right in the beginning anyway (1992-1997). There’s something interesting about the fact that a photographer (and publisher) would produce a book with pictures that are twenty years old, yet the work feels fresh. It doesn’t have the kind of patina that, granted, for a lot of photography makes for its appeal. So maybe this gets us closer to an understanding of “timelessness” in photography: a lack of an obvious patina — a patina that more often than not ties pictures to a feeling of nostalgia. It might seem as if I were at least partly tripping myself up, because the photographs in Past K-Ville are nostalgic. But they’re not nostalgic in the sense of relating to a specific time in the past. Even the nostalgia for the noxious (and blatantly racist) “Make America Great Again” time — that has never actually existed — is obviously yearning for something in the past. No, Steinmetz’ nostalgia is a yearning for a time that could be every time: the time of being in love. If you’re in love now, or if you were in love in the past, or when you’re going to be in love again — that’s the time this photographer is referencing here. So clearly, Steinmetz is not only unrepentantly nostalgic here (and elsewhere), he’s also a romantic (much like Christopher Anderson in his latest book — only after having written and published that piece did I realize that I hadn’t mentioned this possibly most obvious aspect of the work). We’re essentially in the basic territory here that’s being mined by every romance novel or by all the millions of working or aspiring song writers that churn out their wares (there’s no point in beating around the bush). But Steinmetz is too adept a photographer to have his work communicate the kind of syrupy schmaltz that surrounds us in such vast quantities thanks to these aforementioned artists. He will take the viewer straight to the bridge that would take her or him across the abyss to the schmaltz — only to deftly turn around and offer something else. 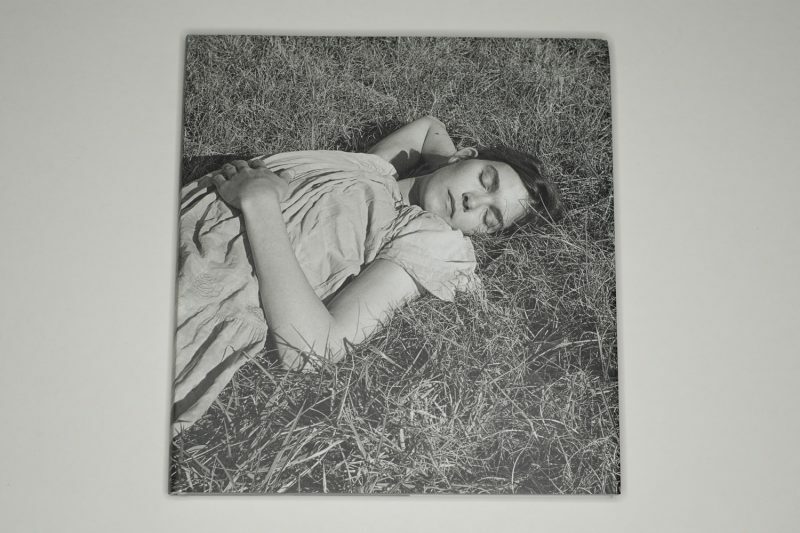 The young woman on the book’s dust jacket is photographed in reverie, and what else could she be dreaming of other than finding love or being in love? Peel away the dust jacket, and you’ll find a little heart — and only that — on the front cover of the book. Inside the book, the same picture is sandwiched by carnal animalistic coupling — literally that: the picture before shows the embrace of two frogs, the picture right after centers on two butterflies. OK, it is at times a bit much maybe, especially the pictures where spray-painted text provides the subject matter (“DAMN, I wish I was [sic!] your Lover!”). Still, a possibly guilty pleasure being toyed with is not what the book’s makers had in mind. And if not every picture therein is about love, for sure it is about the love of making pictures. If anything, Steinmetz has a voracious appetite for finding and making pictures, as I’ve had the occasion to witness a few times. How this intense hunger manifests itself in pictures that are so gentle I can’t quite understand — it is probably this fact that makes me consider him one of the best American photographers working today, best here in the classic sense of making single pictures that can then add up to what they share (and not to what is being put on them after the fact). Maybe the most important property of the photographs in Past K-Ville is their tenderness. There’s a lightness to the photographic touch that in itself doesn’t quite guarantee tender pictures. However, what that final extra ingredient needed for tender pictures is I don’t know. What I do know is that when Mark Steinmetz goes out into the world he brings back an abundance of them. The viewer then is made to enjoy this world that one is tempted to think is just a bit too good to be true, too idealistic, too much in love, a little bit too heartbroken, too… I don’t know. Dial any of this back, and you’re out of that world, but you’re also not dealing with Mark Steinmetz’ pictures any longer.